Created with a hex grid for the Starfiinder Roleplaying Game's unique starship combat system, Flip-Mat: Basic Starfield comes with two different backgrounds - a starlit void in deep space and the brilliant radiance of a nebula - to let you craft epic starship battles and fire your players imaginations. Whether your party consists of bold starfighter pilots strafing an enemy dreadnought or intrepid smugglers running a corporate blockade, this extra-large Flip-Mat has you covered. 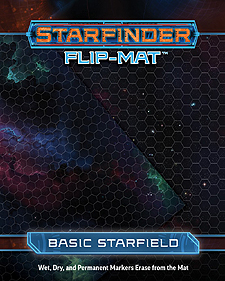 Don't just describe your starship battles - make sure your players experience the excitement of every dogfight and evasive manoeuvre in the perilous vacuum of space with Starfinder Flip Mat: Basic Starfield!